Are the Tories Racist? Am I Bonkers? There are two articles in todays papers concerning my comments re the visit of President Mahama of Ghana to Scotland. They are very revealing. The Moderator of the Free Church of Scotland has been branded “bonkers” after accusing the leaders of two Scottish political parties of being racist.Dundee- based the Rev David Robertson apologised to the president of Ghana for the “rudeness and discourtesy” of several MSPs during his visit to Holyrood last week which was caught up in a row over gay rights. Politicians including Scottish Conservative leader Ruth Davidson and Scottish Greens co-convener Patrick Harvie refused to applaud President John Dramani Mahama at the Scottish Parliament because of the African nation’s much criticised anti-LGBT policies. Singling out openly gay Ms Davidson, Mr Robertson said: “In my view her actions, along with those of Patrick Harvie and some other MSPs, were rude, childish, hypocritical and indeed came with more than an alarming tinge of racism, that comes from the moral superiority of the white liberal elites, who just know that they are at the top of the progressive evolutionary tree. “Ms Davidson belongs to and supports a party which gave a state welcome to the Chinese leader, whose policies on LGBT issues are not that much different from Ghana. For example the Chinese only this year banned images of homosexual couples in the Chinese media.” He also claimed the actions had actually backfired in Africa, with one LGBT campaigner apparently stating Ghana did not need “a white saviour complex”. A spokesman for the Scottish Conservatives said: “This is a ludicrous intervention from someone who you’d think would know better. “The idea that Ruth, and indeed Patrick Harvie, are racist is a bonkers conclusion.” Mr Harvie declined to comment. Responding to calls from opposition leaders last week, a Scottish Government spokeswoman said First Minister Nicola Sturgeon would “share her strong view that the Commonwealth values of humanity, equality and tolerance are universal values” during Mr Mahama’s visit. A LEADING Presbyterian churchman has been criticised for his “ludicrous” intervention after he spoke out against MSPs who refused to applaud the President of Ghana during his visit to Holyrood. The Free Kirk Moderator apologised to Ghana’s President John Dramani Mahama for what he described as the “embarrassing” behaviour of some politicians during the African leader’s trip to Scotland last week. Reverend David Robertson singled out Tory leader Ruth Davidson for particular attention as he highlighted the “rudeness and discourtesy” of those who refused to applaud the leader at the Scottish Parliament because of the African nation’s policies on lesbian, gay, bisexual and transgender issues. Mr Robertson said: “The leader of the Scottish Conservative Party refused to clap the president and made her opposition public. “In my view her actions, along with those of Partick Harvie and some other MSPs, were rude, childish, hypocritical and indeed came with more than an alarming tinge of racism, that comes from the moral superiority of the white liberal elites, who just know that they are at the top of the progressive evolutionary tree. Mr Robertson has been outspoken on LGBT issues in the past. In December the Dundee-based minister appealed to MSPs to reject a call for schools to teach pupils about the issues affecting lesbian, gay and transgender people. Yesterday he said the politicians’ action against Ghana’s president had backfired.He said: “One LGBT activist in Ghana wrote about the harm their actions had done. But that is the trouble with our moralistic politicians. Mr Robertson added: “Meanwhile if by any chance, the Ghanaian President happens to read this, can I as a Scot, apologise sir, for the rudeness and discourtesy of some of our politicians,” he said. Mr Harvie declined to comment. The standard of political discourse in Scotland is at an all time low. If an official spokesperson for the Scottish Tories can only result in insults (bonkers and ludicrous) rather than deal with the substantive issues, then we are in deep trouble. 2. Racism comes in many shapes and sizes. 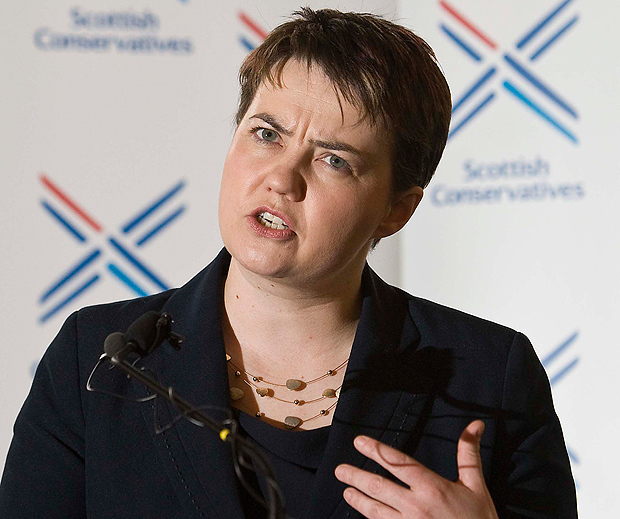 Of course Ruth Davidson is not a racist in the sense of discriminating against someone because of their skin colour. But there are more subtle forms of racism. What I was referring to is the cultural racism of the Western liberal elites (the fact that they are usually white may not be of any relevance), who think that they are the ‘progressive’ countries and others are regressive. In that sense I absolutely stand by my remarks. Ruth Davidson thinks that her values are universal values. And I would like to know why Ruth Davidson protests against the visit of an African president of a democracy, but keeps silent about the visit of the premier of China – a communist autocracy? By the way I exclude Patrick Harvie from this critique because in my view he has always been consistent, even if I don’t agree with him. 4. Sometimes the Press turns things on their heads – They managed to take the fact that some politicians were being critiqued for their rudeness and hypocrisy and turn it into my being called ‘bonkers’ by the Tories (in some circles this would be considered a badge of honour!). Well done to the Tory press department. But it is a sad sign when gesture politics, virtue signalling and name calling have become the standard fare of Scottish politics. Don’t worry David, St. Paul was bonkers too by his own admission – driven to it by the Corinthian church (2Cor. 11) – so you are in good company. Sadly yes. You are bonkers. I often think about what songs would match news items a la Quantum. I take it Dizzee Rascal may be making an appearance shortly! To be fair to the Conservative Party spokesman, he didn’t actually call anybody ‘bonkers’ or ‘ludicrous’. What he said was, “This is a ludicrous intervention from someone who you’d think would know better. The idea that Ruth, and indeed Patrick Harvie, are racist is a bonkers conclusion.” So he was saying that an intervention was ludicrous and a conclusion was bonkers, not a person. However, mgordon42 is a different kettle of fish. Unfortunately s/he has resorted to a personal insult. Obviously not a Christian. But as Dostoevsky said, “If there is no God everything is possible.” Atheists are not bound by any morality other than whatever preferences they choose to follow. There is nothing that obliges them to be civil towards other people. If their preferences don’t include being civil towards other people then they can be as insulting as they choose. Mike, Thanks….but the subtle distinction between ‘what you say is bonkers’ and ‘you are bonkers’ is missed on most people. Usually people assume that bonkers things are said by bonkers people! Whatever it was hardly a worthy remark of a Tory spokesperson and did not help their argument – indeed it only reinforced mine, that the cultural elites in our society are so sure of their own views, that anyone who disagrees with them MUST be bonkers! You are likely to knoiw this story, either by or about GK Chesterton. I think it was about him.